The button links will redirect you away from our page. To open a new tab: Hold the Control (Ctrl) Key when clicking the link button. Garlic is one of the most valuable and versatile foods on the planet not only is it a wonderful aromatic (ahh the smell) and taste enhancement for food it is widely gaining recognition as a health enhancing supplement. Garlic belongs to the Allium family of vegetables along with those other savory treats onions, chives, shallots and leeks. Garlic has been found to promote the well-being of the heart and immune systems with antioxidant properties and to help maintain healthy blood circulation. There are now over 12 studies published around the world that confirm that garlic has been found to help reduce cholesterol. One of garlic's most potent health benefits includes the ability to enhance the body's immune cell activity. There are sulfur compounds in garlic that create allicin; allicin is the chemical that is created when you bruise garlic. The best way to bruise garlic is through chopping, crushing, or chewing the raw garlic. Research has found that the best way to get the benefits of garlic is in the raw form. Well, as a person that loves garlic but can't handle the bit of raw garlic I prefer my garlic sauteed! But don't worry you can still get the benefits of raw garlic in the cooked form; after cutting, crushing or chopping simply allow your garlic to sit for 5 minutes before applying it to your heated pan. Allowing the garlic to sit for 5 minutes lets the sulfur compounds to mingle and create the health benefiting chemical allicin. So remember, bruise your garlic and let it set 5 minutes before applying to heat. Recently researchers in Oxford and America have published some summaries of all the good data on garlic. Garlic is known to stimulate T-lymphocyte and macrophage action, promote interleukin-1 levels, and support natural killer cells. Strong activity of these key cells promotes healthy immune system function, and strengthens the body's defenses. Alliumphobia: A fear of garlic, garlic phobia . . .
Alliumphobia is considered to be a specific phobia; meaning the fear of garlic. People who fear garlic may also avoid other plants that have pungent odors, such as chives, onions or shallots. The origin of the word allium is Latin (meaning garlic bulb) and phobia is Greek (meaning fear). For complete article: Click Here. _What is seed garlic vs food garlic? Food garlic is the smaller garlic bulbs that do not make our seed planting stock standards. These small garlic bulbs are the exact same naturally grown garlic varieties of our seed garlic. These are the garlic bulbs that we eat and they are available to you! Our naturally grown food garlic is the perfect ingredient to add to your favorite recipes. See garlic recipe page for garlic recipe ideas. Garlic is a bulbous plant of the genus Allium, which includes leeks, shallots and onions. The most commonly used garlic is Allium Sativum. A typical attribute of alliums is their bulbous nature. 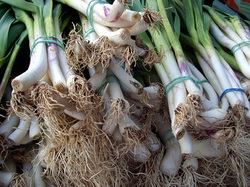 This is evident in some of the most well-known edible alliums: Garlic, Onions, Leeks, Shallot. Some onion-like herbs such as chives are also alliums. Since Elephant Garlic is larger then most garlic, does it have a larger more intense flavor too? Imposter! Elephant garlic is not true garlic; it is a leek. All garlic species are botanically classified as Allium Sativum and elephant garlic is Allium Ampeloprasum, formerly Allium Gigantum. It may look like an enormous head of garlic but in fact it’s a leek. For those that like a milder garlic, it has a very mild garlic flavor and a texture that's more like a potato. What's the difference between a head of garlic, a garlic bulb and a clove of garlic? The entire bulbous root vegetable is a garlic bulb or head of garlic. Within each bulb of garlic there are individual cloves. Depending on the variety of garlic, there may be anywhere between 4 and 20 cloves of garlic in a head of garlic. Should I store garlic in the refrigerator? Never refrigerate garlic. Garlic is a hardy bulb, similar to a daffodil, which utilizes the winter cold to start the growth cycle. Refrigeration will encourage the garlic bulb to sprout. Store garlic unpeeled and uncovered in a cool, dark place. Garlic can be stored in a garlic keeper or a wire mesh basket. You can also use a paper bag, egg carton, or mesh bag – just make sure your garlic has plenty of air circulation and is not exposed to direct sunlight. The season for garlic scapes is very short; they emerge from hardnecked varieties of garlic in late May and can be harvested through the middle of June. 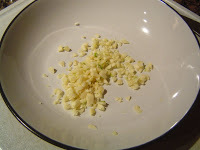 Garlic flavor and intensity can be regulated by how small it is chopped. The finer it is crushed the stronger it will be so if you are cooking with it and you want a lot of flavor cut it up very small.